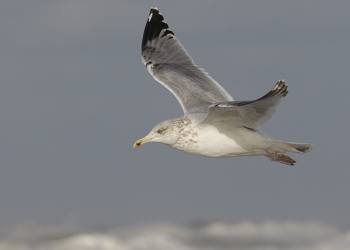 The omithological community has recently shown increased interest in the taxonomy and identification of certain forms within the so-called Herring Gull complex. The attention recently afforded by birders towards this group was possibly triggered by the suggestion to split it into several species. 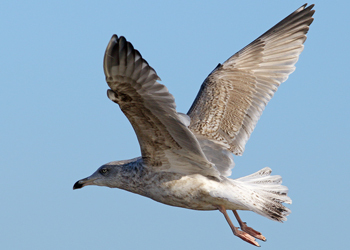 However, the group as a whole, and the Herring Gull Larus argentatus in particular, has long been the focus of taxonomic studies in Europe in the tradition of Stegmann, Goethe, Voous, Barth and several others. 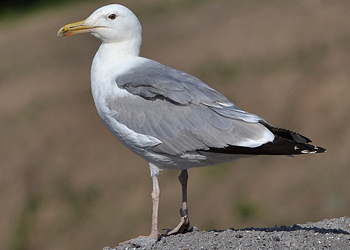 The yellow-legged element of the Herring Gull population in north-east Europe, in particular, has generated many heated discussions concerning its evolution and systematic position. 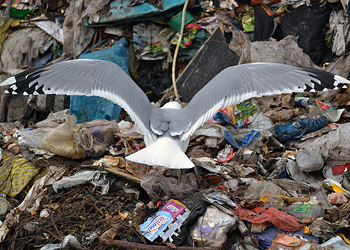 In fact few other groups of birds have received so much attention in the past from taxonomists as these large gulls. While the regular occurrence of the southern form in Scandinavia seems to be a relatively new phenomenon, the debate regarding their taxonomy dates back to the last century. The intention of this article is to discuss the identification criteria for cachinnans and michahellis, two forms of regular occurrence in the Baltic Sea, but with very few records in Finland. 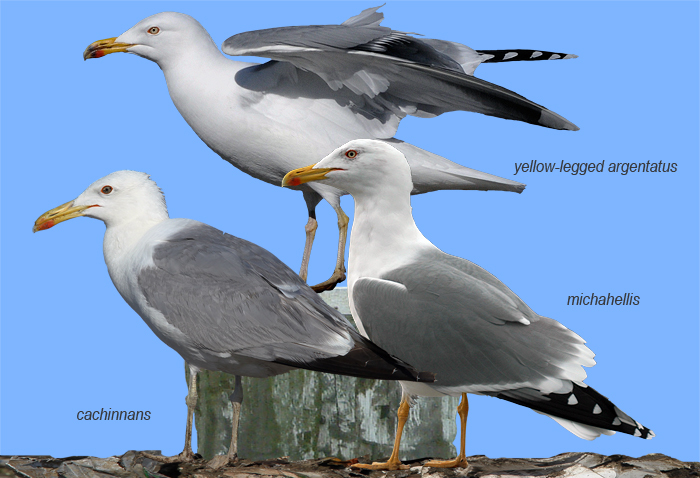 Together with armenicus, mongolicus, barabensis and atlantis they have collectively been known as Yellow-legged Gull Larus cachinnans. 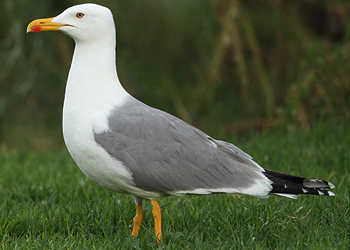 The name Yellow-legged Gull needs to be revised and at least three of the Western Palearctic subspecies should be recognised as species. 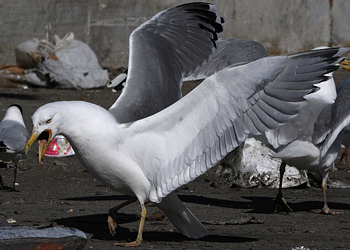 cachinnans, Azerbaijan (Chris Gibbins), argentatus, Finland (Petteri Mäkelä), michahellis, France (Mars Muusse). Herring Gull argentatus adult, April 04 2014, Pori, Finland. Picture: Petteri Mäkelä. Yellow legs and red orbital ring. Mirror merges with tip on P10, but small black spots on both webs. Pale tongue on underside of P10 gradually reaches innerweb edge. No mirror on P9. Band on P5 just broken at shaft. Much of the following material has been published previously in Var Vagelvarld (Jonsson 1996) but this article does include some substantial amendments and additions. A number of well-founded articles have been published over the last few years (e.g. Klein 1994, Gruber 1995, Garner and Quinn 1997 a&b, Klein & Gruber 1997) and it is impossible to describe and discuss the basic fieldmarks without being partly repetitive. I have however tried to emphasise the Baltic perspective in order to encourage birders in this region, in particular to find these gulls. 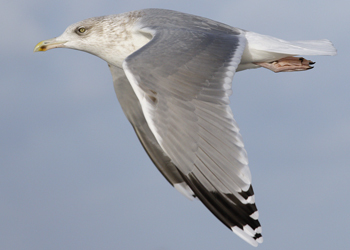 Photographs of several mysterious gulls have recently highlighted the many gaps in our knowledge of the subspecific identification, moult patterns and maturation of not only the more unfamiliar forms, but also of michahellis and cachinnans. 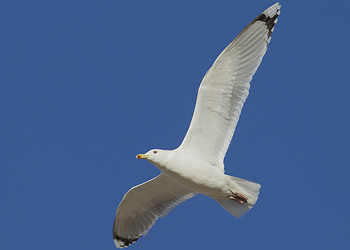 Intensive observation has revealed that not all odd-looking gulls in northern Europe are merely aberrant fuscus and argentatus. Yellow-legged Gull michahellis SHY4 5CY October 20 2006, Croben, Sachsen, Germany (51.14 N 12.25 E). Picture: Jürgen Steudtner. P10 fully grown. Fresh winter plumage, still only limited head streaking. Yellow-legged Gull michahellis adult, January 02 2011, Mamaia, Romania. Picture: Chris Gibbins. Short pale tongue on P10 (yet quite broad with angular ending more common in eatern birds) and full band on P10 and P5. Caspian Gull cachinnans T-001874 5CY, July 18 2013, Deponie Pohlsche Heide - Minden, Germany. Picture: Armin Deutsch. Long parallel bill, dark iris, white tongue on underside of P10. Caspian Gull cachinnans 21P1 8CY, February 13 2013, Deponie Pohlsche Heide - Minden, Germany. Picture: Armin Deutsch. Probably female, with much black on outerwebs of P8-P10. Herring Gull argentatus adult, April 04 2014, Pori, Finland. Picture: Petteri Mäkelä. Yellow legs and red orbital ring. Mirror merges with tip on P10, small subterminal black spot on P10. Broad pale tongue on underside of P10 with angular end. Large mirror on P9, broken band on outerweb of P9. Black line on outerweb of P5. Note white tongue tips. Herring Gull argentatus CA56L adult, April 04 2014, Pori, Finland. Picture: Petteri Mäkelä.Yellow legs and red orbital ring. 'Clouded' iris. Full subterminal band on P10. Short pale tongue on underside of P10 gradually reaches innerweb edge. Large mirror on P9. Note extra pale spot in medial band on P9. Black line on outerweb of P5. During the last 75 years or so there have been two main schools in the taxonomic treatment of the southern forms. In the tradition of Stegmann (1934) they have either been grouped under L. argentatus (Devillers in Cramp & Simmons 1983), or regarded as a separate species L. cachinnans, (Haffer in Glutz & Bauer 1982). 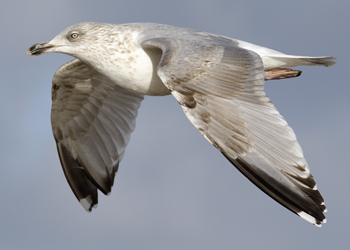 There has been a recent shift towards a more general acceptance of treating michahellis and argentatus as different species. This is in accordance with the findings of sympatric breeding along the French Atlantic coast (e.g. Marion et al. 1985. Yésou 1991). More surprisingly, however, the two forms cachinnans (Black Sea/Aralo-Caspian area) and michahellis (Mediterranean area) also appear to qualify for recognition as two different species, based on cumulative evidence. The small but obvious differences in the field impression between michahellis and cachinnans were first described by German ornithologists (e.g. 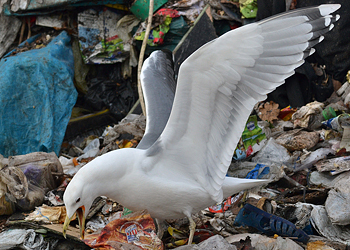 Klein 1994, Gruber 1995), based on observation of ringed birds on rubbish tips in northern Germany. Then, in the spring of 1996, Klein & Buchheim discovered that these two forms had clearly differing breeding habitat preferences and were ecologically separated in the contact zone on the Romanian Black Sea coast (Klein & Buchheim 1997). The two forms also differ in vocalisation and in visual signals during display (e.g. Goethe 1963, Panov et al. 1991, Mierauskas et al. 1991 & 1992, Klein and Buchheim 1997). Preliminary results from ongoing molecular genetic research support this picture. In a limited sample of both forms from the Romanian coast no evidence of mitochondrial gene flow was found (Liebers & Helbig, pers. comm.). The two surely have a common ancestor, but at present they seem to be well isolated, regardless of which species concept we apply. The birding community must be prepared to treat cachinnans and michahellis as representing taxonomic species. The status of the form armenicus has been previously discussed by several authors (e.g. 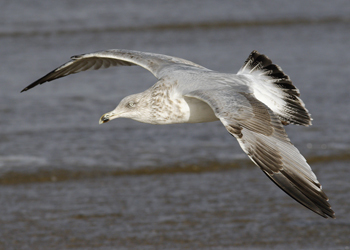 Dubois 1985, Filchagov 1993) and is increasingly looked upon as a separate species; Armenian Gull L. armenicus (eg. Shirihai 1996, Burger & Gochfeld 1996). Armenicus shows several specific and consistent morphological characters which render it readily identifiable in the field under most circumstances. The overall picture is however very complicated and we still need to tie the loose ends together in other areas of the Holarctic, before trying to draw the new definite species lines. I do not make a major issue of whether a certain form should be regarded as a full species or not. The interesting questions are how they relate to each other and how they have evolved. 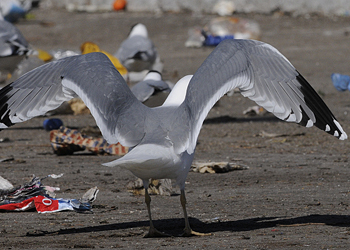 All the large gulls are closely related and seem to have evolved rather recently. Personally, I am interested in evaluating which forms have evolved sufficiently distinct morphological characters to make them distinguishable in the field. With what certainty can we know from which geographical area an specific individual or its genotype originates? Caspian Gull cachinnans DN03919 8CY, November 26 2011, Deponie Pohlsche Heide - Minden, Germany. Picture: Armin Deutsch. White tongue on underside of P10 ends in sharp angle, mirror merged with tip. Caspian Gull cachinnans adult, December 23 2011, Ashdod, Israel. Picture: Amir Ben Dov. 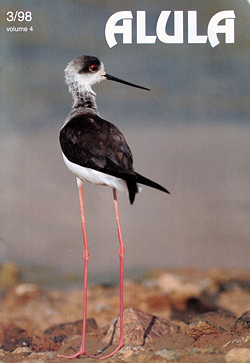 Rather pale-eyed individual. Deep tongue on P10. 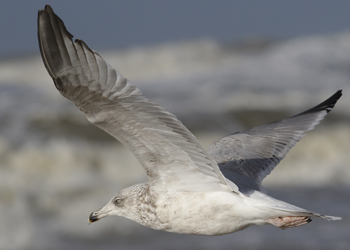 Klein has suggested the German names Steppenmowe (Steppe Gull) to L. cachinnans and Mittelmeermowe (Mediterranean Gull) for L. michahellis. 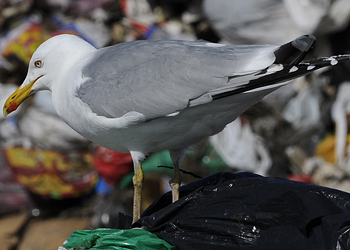 As the English name Mediterranean Gull already relates to L. melanocephalus, an alternative has to be considered. 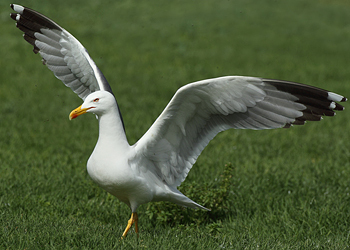 Yellow-legged Gull may transpire to be the most convenient as it has very distinctive yellow legs and the name is already in use. It is however not a very descriptive name as at least a further twelve subspecies/forms of large gulls have yellow legs and one of these. 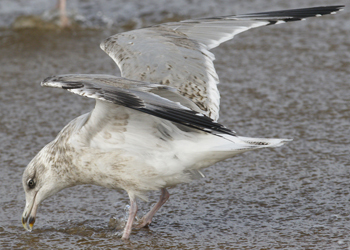 L. livens, has already been named Ye1low-footed Gull. 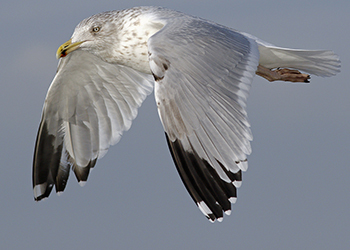 Alternative English names which have been suggested for cachinnans are Steppe Yellow-legged Gull and Pontic/Steppe Yellow-legged Gull (Gamer 1996), Pontic Yellow-legged Gull (Liebers & Dierschke 1997) and Pontic Gull (Pontische Meeuw), the last of which has been adopted by the Dutch taxonomical and nomenclatural committee, CSNA (Sangster et al. 1998). 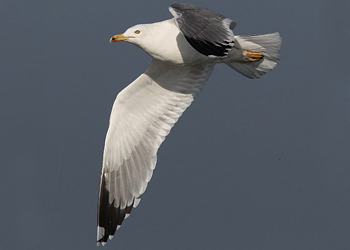 1 strongly recommend that the name Pontic Yellow-legged Gull be avoided since the two forms ponticus and cachinnans (Stegmann 1934) must be regarded as belonging to the same species. The name ponticus probably stems from Pontus euxinus which is the old name for the Black Sea, used in the times of ancient Rome. Pontus or Pontos was also the name of an area in the northeast of Turkey bordering the Black Sea, which was a free state between 381 and 66 B.C. The coasts of this former Pontus do have a breeding population of large gulls; these nest on rocks and cliff-sites, indicating that they are actually michahellis. To choose Pontic as the vernacular name and at the same time dismiss the scientific subspecific name ponticus, from which it is derived, makes little sense. 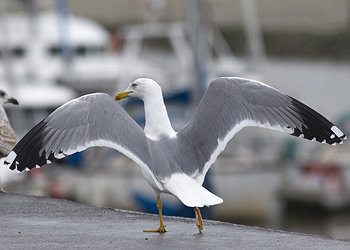 Retaining the name Yellow-legged Gull with respective qualifying prefixes for cachinnans and michahellis may confuse the matter more than it clarifies it. 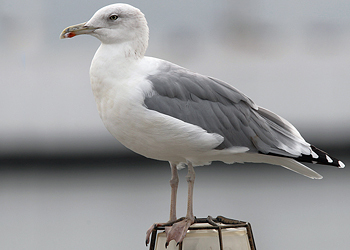 I have suggested the Swedish names Kaspisk trut (Caspian Gull) and Medelhavstrut (Mediterranean Gull) respectively. 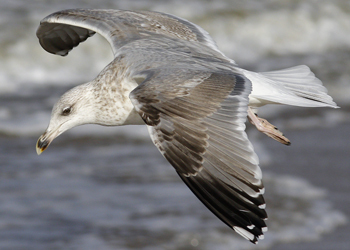 The name Caspian Gull is intended to include both eastern and western/Pontic cachinnans and is based on the fact that it was first described from the northern Caspian Sea and the lower Volga (Pallas 1811). The central and northern part of the Central Asian steppes are occupied by another, more clearly defined form, barabensis, the exact taxonomic status of which still needs to be clarified; I suggest that this question is still left open. 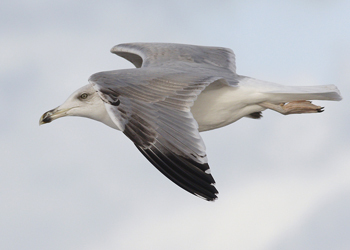 The forms ponticus and cachinnans are both more closely associated with the larger central Asian lakes and their systems while the actual steppe Kirgiz and Baraba Steppes) is the home of the darker-mantled barabensis, for which it may be wise to reserve the name Steppe Gull. 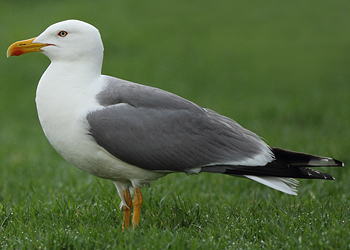 Should ponticus, cachinnans and barabensis be eventually regarded as a single species, the name Steppe Gull for these forms would make more sense. 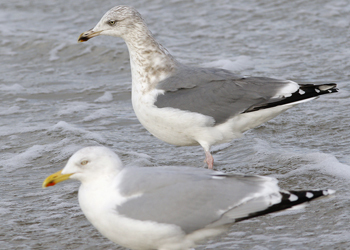 In the following discussion I will tentatively refer to Yellow-legged Gull Larus michahellis and Caspian Gull L. cachinnans. However I wish to stress that I regard this as a contribution to the ongoing debate, rather than a final conclusion. 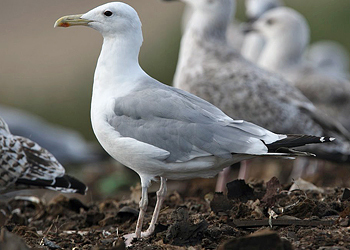 There have been major changes in distribution of many of the larger Larus species during recent decades as a consequence of the adaptation to human activities. 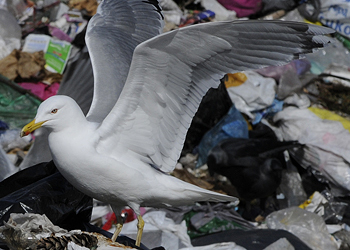 The increased feeding options created by rubbish tips and modern fishing trawlers, combined with a decrease in disturbance at the breeding sites may be the most important reasons for these recent range extensions. Michahellis has expanded northwards and is now breeding locally in most parts of central Europe to approximately 52° north. 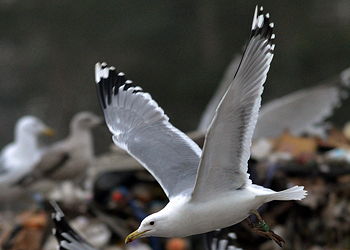 Tens of thousands of Yellow-legged Gulls migrate northwards after breeding and some regularly reach southern Scandinavia. Cachinnans has also expanded northwards along the major rivers, and is now breeding near Moscow, while in central Europe it breeds at least in eastern Germany and Poland. 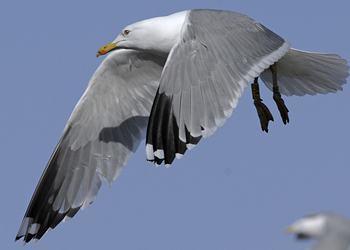 New colonies along the Vistula river in southern Poland hold all three forms – argentatus, michahellis and cachinnans. The occurrence of cachinnans in the Baltic region is therefore logical and might increase in the future. The present northward expansion may also account for the current increase in the occurrence of cachinnans in Israel during winter. Numbers there have increased from virtually zero in the eighties to many thousands in recent years (7.360 adults counted in Shifdan in late February 1997, Ehud Dovrat pers. comm). The western boundary of barabensis may also have expanded into easternmost Europe recently. 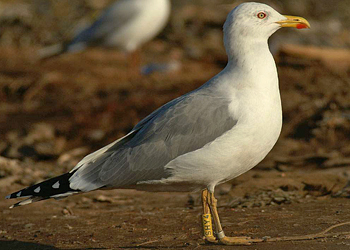 Among a few gulls collected by Andrei Filchagov at a breeding colony at Kasan (on the Volga) in May 1993, one individual transpired to be barabensis. I observed three adult/sub-adult individuals near Moscow in September I 997, possibly indicating regular occurrence or breeding west of the Urals. Which forms occur in the Baltic? 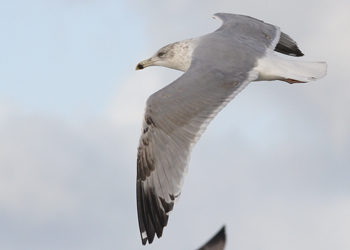 Observers of large gulls in the countries around the Baltic Sea can now expect to regularly find cachinnans, michahellis, heuglini, intermedius and graellsii, and possibly also barabensis among the hordes of the traditionally common argentatus and fuscus. The question is how do we tell them apart, and how sure can we be of each individual’s identity? In this article I will try to outline the basic criteria for identifying michahellis and cachinnans in the field. The forms heuglini and barabensis are largely omitted from this discussion, as a more thorough paper covering these forms is in preparation for publication later (Jonsson, in prep.). The following phenology is based on Swedish records, i.e. my own experience from Gotland during the last five years and records from Christian Cederroth on Gland and Hans Larsson from Scania. Very few records have been published from the central Baltic area. From southern Scandinavia there are more published records, but these might be less relevant for the seasonal occurrence in Finland. Yellow-legged Gull michahellis adult, November 24 2006, Etaples, NW France. Picture: Mars Muusse. Full band on P10, black on P4. Caspian Gull cachinnans DN03919 8CY, November 26 2011, Deponie Pohlsche Heide - Minden, Germany. Picture: Armin Deutsch. White tongue on P10 ends in sharp angle, mirror merged with tip. Yellow-legged Gull michahellis adult, April 16 2011, Tel Aviv, Israel. Picture: Amir Ben Dov. Short tongue on P10, much black on P7-P10. Caspian Gull cachinnans adult, 08-13 April 2009, Riga, Latvia. Picture: Chris Gibbins. Pale iris. Note broken band on P5. After the breeding season substantial numbers disperse northwards from mid June onwards, and in northern continental Europe the numbers peak in August and early September, and decrease after October. The early fledging of juvenile michahellis makes any independent juvenile Herring Gull before 1st August worth scrutinising. During the winter months the adults return southwards. 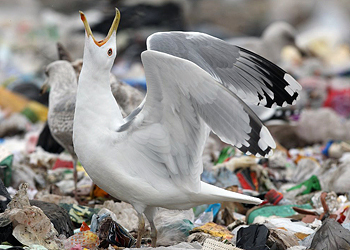 Immature birds, however, remain to some extent in central and Western Europe. On Gotland, the majority of michahellis have been 1st cy birds, possibly a reflection of the difficulties involved in identifying sub-adults and adults. 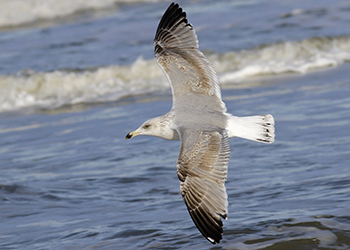 It seems that adult and near-adult michahellis are very rare north of the German Baltic coast. Cachinnans generally breeds later and the major influx of migrants can be expected from mid August throughout the autumn, with juveniles peaking in late August-early September. 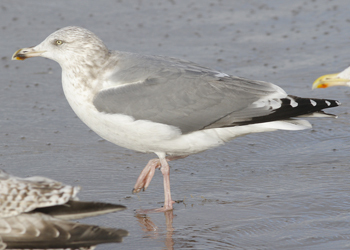 Prior to this a few sub-adults can be seen during summer, especially with the onset of the argentatus movement during July-early August. Southerly or south-easterly winds around the 25th August have always brought a few cachinnans to the southern tip of Gotland in the past three years. Adults and near-adu1ts dominate later in the autumn. On Gotland I saw around 50 individuals in the autumn of 1996 and around 100 were seen by Cederroth on Gland. 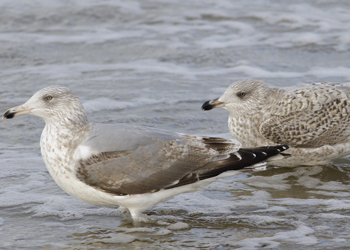 Unlike michahellis, cachinnans tends to stay in the southern Baltic Sea (northern Germany) throughout the winter, and is therefore a more likely candidate for winter observations at more northern latitudes. In southern Scania and north Germany January-March records of cachinnans are scarce but regular. A few individuals were reported from Gland and Gotland between late December 1997 and early January 1998. There was an obvious influx into eastern Germany in January 1998, with 2.000 reported in Sachsen and up to 170 in Mecklenburg (Buchheim pers. comm.) Personally, I have seen only two in spring, both in May. 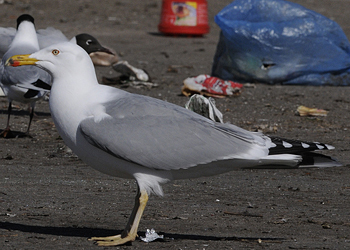 Caspian Gull cachinnans adult, September 11 2011, Baku, Azerbaijan. Picture: Chris Gibbins. Greeny-yellow bill and almost clear iris. P8/-. Caspian Gull cachinnans adult, August 2008, Riga, Latvia. Picture: Chris Gibbins. Probably female. Yellow-legged Gull michahellis adult, April 25 2011, Tel Aviv, Israel. Picture: Amir Ben Dov. Angular head, saturated bare part coloration. Yellow-legged Gull michahellis adult, April 25 2011, Tel Aviv, Israel. Picture: Amir Ben Dov. Angular head, saturated bare part coloration. 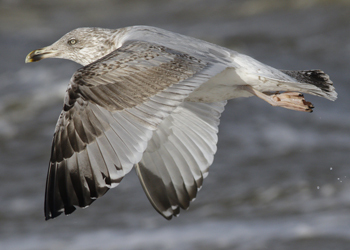 Below are a few images to illustrate flying 4CY and 5CY Herring Gulls (sub-adult Herring Gulls of the subspecies argentatus and argenteus) for the month January. These are all unringed birds, hence no provenance on origin and/or true age. Herring Gull (argenteus) CPAJ 4CY (3rd cycle), January 10 2011, Koksijde, Belgium. Picture: Peter Adriaens. Herring Gull (argenteus) FBAD 1CY,2CY,4CY, 6CY, October 2006 - February 2011, Oostende, Belgium. Herring Gull (argenteus) K.BMF 1CY-4CY, September 2014 - January 2017, Den Haag - Scheveningen, the Netherlands. Herring Gull (argenteus) K.CDC 4CY, January 18 2019, Katwijk, the Netherlands. Herring Gull (argenteus) 9||+ 4CY, January 29 2019, Katwijk, the Netherlands. 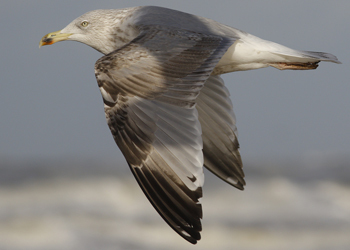 Herring Gull argenteus 3.3 3CY-4CY, September 2016 & January 2017, Westkapelle & Scheveningen, the Netherlands. Herring Gull (argenteus) 3.5 4CY, January 24 2017, Scheveningen, the Netherlands. Picture: Mariska van der Graaf. Herring Gull argenteus 3.F 4CY, January 28 2017, Scheveningen, the Netherlands. Herring Gull (argenteus) 5.9 4CY, January 23 2017, Scheveningen, the Netherlands. Herring Gull argenteus YX 4CY, January 03 2019, Noordwijk, the Netherlands. Herring Gull (argentatus) HXK39 4CY, January 20 2017, Scheveningen, the Netherlands. Herring Gull (argentatus) DKC 4414468 4CY, January 18 2019, Katwijk, the Netherlands. 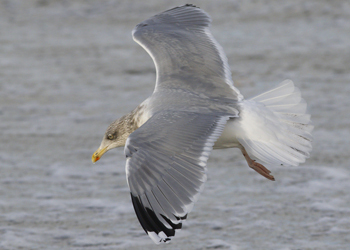 Herring Gull (argentatus) C59VH 2CY-6CY, February 2010, January 2012 & November 2014, the Netherlands. Herring Gull 5cy HT-195.171(argentatus), January 04 2002, Boulogne/Mer, France (50.42N,1.34E). Herring Gull (argentatus) KFU4 4CY, January 06 2013, Terschelling, the Netherlands. Picture: Jacob Jan de Vries. Herring Gull (argentatus) KN52 4CY, January 17 2005, Lauwersoog, the Netherlands. Picture: Herman Bouman. 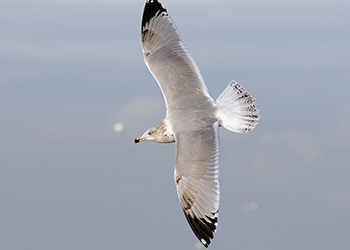 Herring Gull (argentatus) J3834 sub-adult, January 02 2015, Hovindam - Oslo, Norway. Picture: John Sandøy. Herring Gull (argentatus) J7518 4CY, January 08 2015, Hovindam - Oslo, Norway. Picture: John Sandøy. Herring Gull (argentatus) JL140 4CY, January 18 2019, Katwijk, the Netherlands. Herring Gull 4CY, January 20 2016, Katwijk, the Netherlands. Herring Gull 4cy (argentatus), January 30 2010, Westkapelle, the Netherlands (51.33N-03.25E). Very mottled individual. Herring Gull 4cy (argentatus) January 30 2010, IJmuiden, the Netherlands. Herring Gull 4cy (argentatus), January 20 2012, Scheveningen, the Netherlands. Herring Gull argentatus sub-adult, January 29 2010, IJmuiden, the Netherlands. Herring Gull argentatus 4CY, January 05 2011, IJmuiden, the Netherlands. Herring Gull sub-adult (argentatus), January 20 2012, Scheveningen, the Netherlands. Herring Gull sub-adult / 4cy, January 16 2013, Katwijk, the Netherlands. Herring Gull sub-adult / 4cy, January 23 2013, Katwijk, the Netherlands. Herring Gull sub-adult / 5cy, January 23 2013, Katwijk, the Netherlands. Herring Gull sub-adult / 5cy, January 20 2012, Scheveningen, the Netherlands. Herring Gull sub-adult / 5cy, January 06 2012, Katwijk, the Netherlands. Herring Gull sub-adult / 5cy, January 16 2013, Katwijk, the Netherlands. Herring Gull 4CY, January 08 2014, Katwijk, the Netherlands.